So apart from the earliest moments, when I was working on my son's bedtime, I watched almost the entire leader's debate put on by Rogers Media, hosted and moderated by Maclean's (with the magazine's political editor Paul Wells serving as moderator). I shan't go into much detail tonight, and I'm not sure I'll attempt a full analysis over the weekend, but I wanted to touch on a few key things. I'm prepared to say that, in my view, Elizabeth May put in the best overall performance in the debate. I'm not convinced she was the clear winner, because I'm not convinced there was a clear winner (of which more below), but as far as I can see, she had the best showing. It was sometimes a bit difficult for her to get a word in edgewise, but when she did, she was quite effective. She was concise, made specific points pertaining to the subject at hand, and as often as not had a specific reference to some evidence, or expert opinion, or other detail to back up her claims, all in a manner that I don't quite think the other participants managed as well. Her performance was noteworthy enough that it apparently took Twitter by storm. During the post-debate segment, the analysis team included representatives from Facebook and Twitter, and the Twitter rep showed a graph that demonstrated moments when May, quite simply, dominated the field. I didn't find a screenshot of that graph when I performed a Google image search, but if I find it later, I'll add it to this post. One interesting observation that came up during the post-debate analysis, noted by both the panel of analysts and by moderator Wells, was that the participants were all, effectively, engaging in a manner that suggested they were trying "not to lose" the debate, as it were, more than they were trying to win it. This makes a certain degree of sense: as Wells noted (if memory serves) near the very end of the post-debate segment, it's only a few days in to an eleven-week campaign. No one needs to try to make big plays to swing the polls at this stage. Playing it safe, therefore, makes sense for most of the candidates. The participant who came closest to engaging in a riskier "play to win" strategy was Justin Trudeau, leader of the Liberal Party of Canada. This makes sense, because of the "Big Three" parties (the Liberals, the Conservative Party of Canada, and the New Democratic Party), the Liberals are currently in the worst position in the polls. He was, it seemed to me, more willing to come out swinging in an attempt to land a haymaker or two, although it did lead to his coming across as allowing (NDP leader Thomas) Mulcair to goad him when the debate turned to Quebec separatism. Overall, though, the strategy of playing to "not lose" paid off; none of the participants came across as having been decisively beaten by any of the others. That said, I think the panel of analysts overrated Harper's performance. While he managed to keep his composure, remain unflappable, and stick to his talking points, in my view his biggest weakness was that he stuck to his talking points after they were called into question, without mounting an effective defence. The only subjects on which Harper seemed to engage more were those of the self-styled "Islamic State", and Israel. Otherwise, he mostly tried to repeat his desired message. The weakness of this approach, though, was that when others poked holes in his talking points, he often didn't have a response. Harper maintained throughout that his government was the best choice on the economy; I don't recall him effectively defending his record against Mulcair's summary of recession woes, eight years of budget deficits, and $150 billion in additional federal debt; nor against May's summary of his government's record on greenhouse gas emissions; nor against Trudeau's noting that the Conservative backbench has had troubles with, shall we say, racially-charged language, from time to time. The closest to a good comeback he had, as I recall, was during the discussion on the Senate, when he tried to turn the tables on Trudeau with respect to Senate voting. Even then, however, it wasn't nearly as good a twist of the knife as Mulcair's dig on the government's behaviour with respect to the Climate Change Accountability Act, in which the PMO ordered the Conservative Senate caucus at the time to kill the bill before it even had an opportunity to be considered and debated by the Senate. (Mulcair asserted this was a first in Canadian history.) Had he the chance, he may have wanted to twist the knife a bit more with reference to more Senate skulduggery on the part of the Conservative caucus, with respect to Bill C-377, or perhaps the Conservative government being found in contempt of Parliament (again, so far as I recall, another first in Canadian history). Not only did "staying on message" hurt Harper defensively, it also hurt him offensively. Where Mulcair, May, and Trudeau could bring up specific examples of Conservative misgovernment, Harper resorted to vague generalities when attempting to critique his opponents. He could have pointed to particular policy planks and said "this won't work, here's why". But on the whole, he didn't. 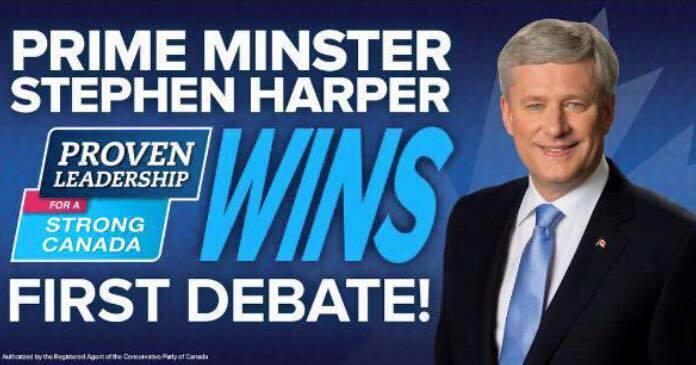 Now, because the other leaders weren't "playing to win", I don't think Harper was a clear loser. But he came across to me as the weakest participant, precisely because he had the least to offer, except for "Conservatives good, taxes bad, mmkay?" 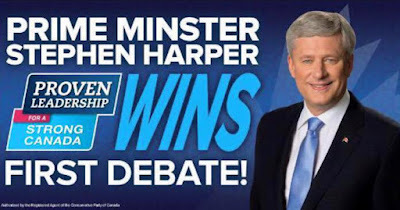 Interestingly enough, the biggest gaffe didn't happen during the debate: it happened right after, when (predictably), the Conservative Party declared Harper to be the winner on Twitter. You get three guesses as to what went wrong here, and the first two don't count. While the picture was promptly corrected, it was too late: the damage was done. Because let's face it, a gaffe by a debate participant, caught up in the cut-and-thrust and speaking off the cuff (to some extent), is understandable. Screwing up a promotional image that, presumably, could have been prepared well in advance (and been reviewed by multiple proofreaders and signed off by the marketing team, such as it is), is an embarrassment. I can't say I'm the best at writing conclusions, and it's late so I won't try to hard this time either. But anyway, those are my thoughts on the outcome of the Maclean's 2015 federal Canadian election debate.